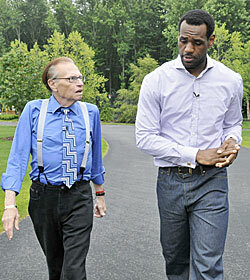 We will not lie: That LeBron James chose to do his first extended post-playoff-exit interview with Larry King makes us wonder whether he's really as brand savvy as everyone claims he is. (The doddering old man inspired a great #larrykingquestions Twitter hashtag last night.) With everyone hanging on LeBron's every word, the Post claimed "The King Disses Knicks." That seems like an overstatement. Basically, LeBron said the Cavaliers would have the advantage, because he grew up there and he played there for so long. We're not sure how that's a "dis" on the Knicks. "Because, this city, these fans, I mean, have given me a lot in these seven years," he said. "And, you know, for me, it's comfortable. So I've got a lot of memories here ... so it does have an edge." "I'm far from close [to a decision]," James said. "I've thought about it, but I haven't begun to strategize exactly." In other words, he didn't say a darned thing. Obviously. You will note that the Cleveland Plain-Dealer's website is not exactly trumpeting this as LeBron's return. The video was taped last night and will run Friday, for Larry King Live's 25th anniversary. We think you can feel pretty comfortable missing it.